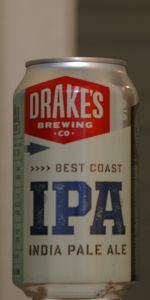 Best Coast IPA | Drake's Brewing Co.
"Drake's flagship beer! A "West Coast" interpretation of an India Pale Ale. Copper-colored from additions of light Crystal malt, and body-building Caramalt, carry the malt weight of this hop bomb. The hoppy aromas of pine and grapefruit are delivered from the abundant Columbus and Cascade hops." This beer pours a hazy orange-amber color and is topped by a frothy, tan colored head that has a bit of a creamy texture to it. The aroma is predominantly citrus (with notes of orange, tangerine and a bit of apricot), but there is a back drop of a subtle herbal pine note. The beer is initially a bit too cold and has a sharp bite in the finish. The beer is quite citrusy up front, a bit like candied orange peel, but not all that sweet. The malt here is of course secondary, but adds a sweetness that accentuates the citrusy hop notes. There is a nice piney, herbal note in the finish that helps to accentuate the sharp bitter bite. Quite a nice IPA, I could definitely drink a couple of these. Poured a clear orange/amber with a spongy off white head. Left decent lacing. Nice, crisp fresh hop smell with citrus peel nuances. Sweet malt was also present. Sweet malt and a big citrusy hop flavor. Finishes flowery and perfumey with a lingering bitterness. Creamy full bodied mouthfeel with a touch of viscosity and good carbonation. Good drinkability. A - a slight cloudy bronze apricot with a feinger of stucco white head. Let a nice lace. S - Citrus rinds of orange and grapefruit with some floral hints. T - A good dose of pine and citrus hit your palate and lead to a somewhat sweet bitterness. A little complex, very nicely done. I prefer a bit more hop presence in my IPA's, but this one is good. Solid carbonation and good feel on the palate. Glowing pumpkin orange with polished brass highlights. The three finger crown of orange tinted ivory tells me that quality beer awaits. The foam is thick and rich and is a fabulous lace maker to boot. A good start. For what is supposed to be an English IPA, the nose sure does have a lot of West Coast hopitude. Not so much in quantity, although it's fine in that regard, but in quality. Sweet orange and white grapefruit suggest that one or more of the C-hops are present. Most likely Cascade. To my way of thinking, it's difficult to brew an English IPA using American hops. This beer is a perfect example. There's really nothing English about it at all. Although it isn't one of the more aggressive versions, it's still pretty hoppy. And that, as we all know, is the key to a good IPA. The amount of pale malt (in terms of flavor, sweetness and mouthfeel) is pretty close to ideal. The malt sugars take some of the rough edges off the alpha acids, while not quite completely civilizing them. White grapefruit is now in the lead, with bitter orange close behind. Hmmm... maybe Centennial as well. I can usually tell that the mouthfeel will be good after seeing and hearing the beer splash into the glass. Such was the case here. This one has a wonderful silky smoothness and a perfect amount of soft carbonation. Well done. Drake's IPA is good. Really good. It seems as if every craft beer that comes down the pike claims to have won a gold medal at some competition or other (going back decades in some cases), but this gold medal winner well and truly earned it. If you love hops, drink Drake's IPA fresh. It's a tongue-pleasing treat. Pours a hazy caramel to gold color with a tall tan head. Smell is floral and citrus. Taste is sweet caramel malt followed by a sharp piney and citrus back of the throat hop bite. Mouthfeel is moderate to slightly oily with a crisp finish. Somewhat low to moderate carbonation. The full savoury hop leaf in abundance,above average mouthfeel. What this means is piney, resiny, a tad astringent. Grapefruit from the West Coast hops. A very good English style IPA. Orange colouring and good hop aroma to boot. Thanks to Captain Couger. 4.5 years later I had this on tap and it hit the spot with very good hoppiness, drinkability, upraded rating. Goofy plastic label on the glass bottle touts the GABF golg medal. Pours with a hazy ochre orange topped with a spotty thick beige head cap leaving decent lace in the glass. Scents are big with a blanace of grainy hops and thick orange peel and lemon citrus. First swigs: Solig grainy malt balances the orange peel and citrus blend. Some dusty bitterness and tea like astringency. crisp feel with a dry bitter finish. This is a mouth parcher. Pours butter colored, a bit murky, solidly etched fine white surface. Smells dank, with citrus, pine, resin, coconut, pineapple, biscuity malt, Flavor is bitter, but still quite malty with a cracker like malt. Hops are plenty juicy with some tropical character, some more pine, some orange peel and a little honey. Medium bodied with moderately assertive carb and a wet finish. Nice beer, would drink again for sure. 12 ounce bottle, no freshness indication offered. Pours auburn hued amber, typical looking off white head, leaves respectable tongues of lacing on the glass. A: Hoppy with aromas of orange peel with faint pine and resin. A: Orange color with a gold hue, clear, with moderate, dense white head that has adequate retention. T: Moderate citrusy hops, followed by light malt caramel sweetness. Fairly crisp and well balanced with a moderately light hop bitterness and lightly dry finish. O: Solid; Made in the classic west coast style the beer is well balanced with a clean hop profile. I have seen Drakes beers as guest beers at brewpubs around the Bay Area. Never tried it at a brewpub, why drink a guest beer when you can drink a house beer? Since the brewery now bottles their beer and sell it at B & M I had to buy a six pack and try it. Pours an amber copper root beer color with an eighth inch head and lots of carbonation. The smell is hoppy with an evidence pine and grapefruit aroma. The malt taste has some sweetness of toasted caramel with a great slightly nutty licorice after taste that fades away to the pine, grapefruit, and lime hoppiness flavor. The mouthfeel has a slightly syrupy feel with medium carbonation throughout. The drinkability is great maybe I should drink the guest beers at brewpubs once in a while. Bottle of drakes ipa drank. Best Coast IPA from Drake's Brewing Co.